A private riverfront estate awaits behind the gates at the end of a romantic winding drive. Pass through an abundance of palm trees, tropical, verdant grounds and you will discover the soothing sounds of a fountain and a Bermuda-style home, a majestic achievement of Anchor Builders, epitomizing the best of artisan-fueled craftsmanship. The interiors mix formal with informal, accommodating relaxation and entertaining with equal finesse. Sunlight sparkles through the entry foyer and opens to the formal living room with stately fireplace; sliding glass doors frame views of the infinity-edge pool and the commanding presence of 140 8217; of the Manatee River. To the right, a chef 8217;s kitchen, breakfast room with aquarium glass, and family room are designed for entertaining and everyday living. The kitchen is equipped with a walk-in pantry, gas cooktop, built-in bar with wine fridge, and double dishwasher. The home includes multiple dens, a guest/family wing with three bedrooms and space to spread, large theater room, office, mudroom, expansive laundry/crafting room, whole house generator, and impact windows and doors. The luxuriant master suite opens to a sitting room and private 500 sf balcony overlooking the water. Outside, waterfront vistas enhance the infinity pool and outdoor kitchen 8211; ideal for grilling the catch of the day. Trees of mango, starfruit, bananas, lemons, limes, and avocado color the landscape. A 230 8217; dock with Trex decking and boat lift will have you experiencing the pinnacle of nautical living. 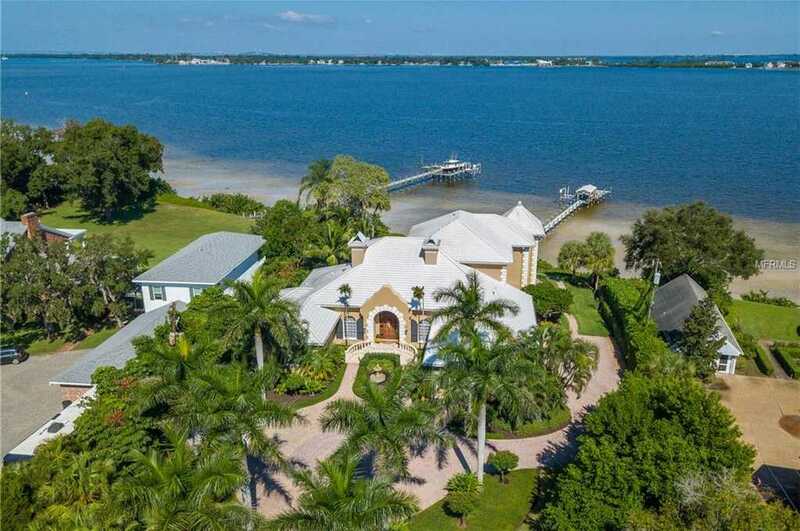 Please, send me more information on this property: MLS# A4421873 – $3,450,000 – 5100 Riverview Blvd, Bradenton, FL 34209.